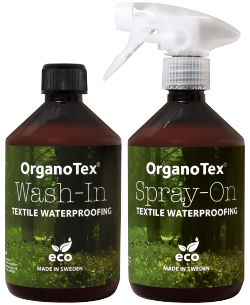 OrganoTex® Textile waterproofing is a biodegradable water repellent product applied on garments or textile products by spray-on or wash-in in washing machines. The product re-impregnate garments and textile products where the previous impregnation has been worn-out or impregnates garments or textile products that never has had water repellent properties. The product was awarded with the Scandinavian Outdoor Sustainability Award in 2018. After extensive use, most outdoor garments lose their water repellent properties due to mechanical abrasion or severe washing. 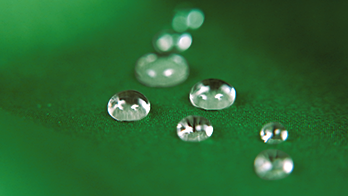 OrganoTex® Textile waterproofing effectively restores the water repellent properties to the garments. The products can however, also be used for impregnation of clothes and textile products that have never had water repellent properties such as fashion clothes, pillows or textile furniture. As the products are not film forming and binds effectively to the fibers, the softness and breathability of the fabrics are not affected and the garments thus remain their original feeling. OrganoTex® Textile waterproofing is currently sold through a network of retail and brand partners in Scandinavia such a Naturkompaniet, Alewalds, Topsport, Houdini, and Kronans barnvagnar. The products are readily biodegradable in accordance with OECD 301C, free from fluorocarbons (e.g. PFAS, PFOS, PFOA), cyclic siloxanes, isocyanates and other proplematic commonly used textile chemicals. They are classified as non-toxic according to CLP and are thus easy to use for consumers. In 2018, the products won the Scandinavian Outdoor Sustainability Award. OrganoTex® Textile waterproofing spray-on is a universal impregnation that can be used on most textiles to improve the water and dirt repellent function. The product re-creates the water repellent ability of the textile without changing the color, texture or breathability of the fabric, which is important for all types of functional garments. Waterproof fabrics (with all different waterproof membranes) shells, parkas, down products, hiking pants, windbreakers, tents, sleeping bags, backpacks, textile shoes and other outdoor textiles such as cushions, umbrellas, e t c.
Polyester, polyamide, soft-shell, wool, fleece, cotton, canvas, acrylic and various blends. Best effect is achieved on synthetic materials, such as polyamide and polyester. 1) Wash the textile or garment without using fabric softener. We recommend OrganoTex BioCare Wash or similar “pro wash” for functional fabrics. Ensure the fabrics is completely dry. 2) Protect the work surface, shake the bottle and spray the garment/ textile at a 20 cm distance making sure the fabric gets evenly wet. 3) Wait 1 minute, spray again and rub the liquid evenly with a cloth (protective gloves are recommended due to PH). 4) Remove excess liquid with a cloth or sponge, do not leave any drops as this may cause stains. Do not overdose the liquid. 5) Tumble dry or use drying cabinet (40-70 degrees) for best performance or air dry as warm as possible in minimum 1-2 days in order to reach full water repellency. For previous DWR* treated garments, tumble drying or dry cabinet are highly recommended. The heat is required for the fibers to divide and rise properly, which contributes to the water repellent function. *) DWR= Durable Water Repellent, a water repellent finish applied industrially on the face fabrics. Waterproof functional garments (with all different types of membranes) shells, parkas, down products, hiking pants, wind jackets, ski clothes etc. that are able to be washed in a washing machine. Polyester, polyamide, soft-shell, acrylic, acrylic and various blends. Best effect is achieved on synthetic materials, such as polyamide and polyester. 1) Wash the textile or garment without using fabric softener. We recommend OrganoTex BioCare Wash or similar “pro wash” for functional fabrics. Leave the garment in the washing machine. 2) Shake the bottle and dosage 100 ml for one garment in the detergent compartment. It is possible to run up to 3 pcs, add 50 ml for each new product. 3) Run a short washing program of 30-40 degrees with centrifugation or according to the garments care instructions. 4) Tumble dry or use drying cabinet (40-70 degrees) for best water repellent performance or air dry as warm as possible in minimum 1-2 days in order to reach full water repellency. Hand wash: Dosage 50 ml for 10 L water. Use protection gloves. Rinse careful! Dry as warm as possible for 1-2 days. Excellent for tents to put in a bath in order to improve the water repellency. Consumption: 100 ml/garment, sufficient for 5 pieces, or 10-12 sqm fabrics. 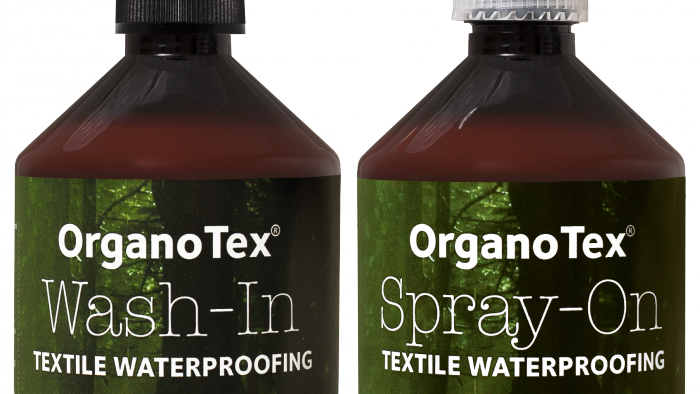 OrganoTex® Waterproofing is a biodegradable textile impregnation for consumers. OrganoTex® Industrial DWR is a biodegradable DWR for industrial use. Brands using the OrganoTex®-technology are offered an attractive co-branding platform. 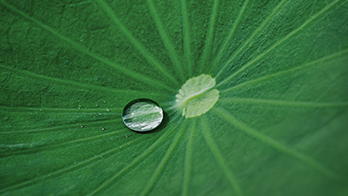 The OrganoTex® technology is inspried on nature’s own chemistry and the water repallancy of the Lotus flowers leafs. With the use of the patented OrganoClick®-technology we use biodegradable plant-based catalysts and organic water repellent polymers (hydrophobic) in order to create the water repellent properties to the fabric.